I signed up for my fifth Great Canadian Birdathon earlier this week. As you might know, I’ve participated since 2012 in the Great Canadian (formerly the Baillie) Birdathon, the oldest sponsored bird count in North America, hosted by Bird Studies Canada. This year I signed up with the goal of raising $1,575. Part of the money will go to the Calgary Bird Banding Society, and the other part to Bird Studies Canada. This year, I’m hoping to see at least 100 species — I saw 76 last year. 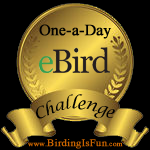 Here are my Birdathon results from 2015, 2014, 2013, and 2012. I would like to offer an enormous thank you to my good friends Curtis & Michelle, and to Sandy, for their early donations to my Birdathon! If you’d like to sponsor me, you can visit my team page. I’d be delighted to reach my goal for my fifth Great Canadian Birdathon, to help the very worthy cause of bird conservation. This entry was posted in Alberta Birds, Birding, Birding Events, Blogging, General Birding, Great Canadian Birdathon, Spring and tagged Bird Studies Canada, Calgary Bird Banding Society, Great Canadian Birdathon. Bookmark the permalink.